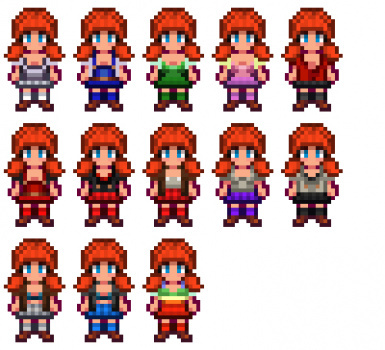 Body replacers for female character in Stardew Valley. Created with the aim for a more feminine character. Due to RL priorities I have been negligent in updating this mod and replying to comments, my apologies. Part of this mod has been incorporated into the Get Dressed mod by Jinxiewinxie and Advize. Originally I posted this mod on the Stardew Valley forums, but decided to upload it here too. 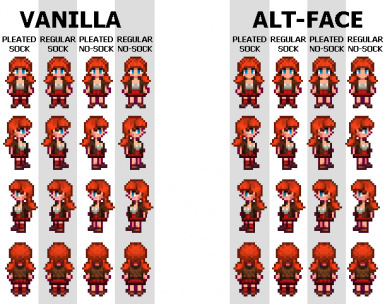 The aim of this mod was to create more obvious feminine character which lead to this mod. Variations: vanilla head and round head2 types of skirts - pleated and plain with or without socks. Replaced Grandpa's bikini with a more modern one. Refer to this picture to figure out which file you prefer. Do note that this replaces the female body file (farmer_girl_base.xnb). *Note: these shirts will be added to the vanilla shirts and will replace none. Place the content of the zip file in Stardew Valley\Content\Characters\Farmer folder. It's always wiser to back-up your old files: farmer_base.xnb \ shirt.xnb or accessories.xnb before replacing it.